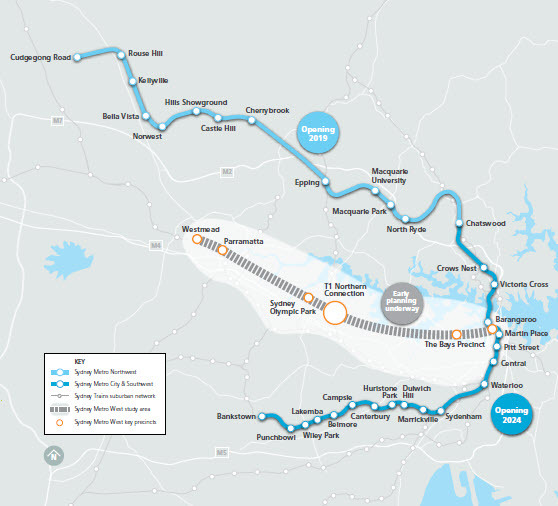 ← The Sydney Metro – a better option? 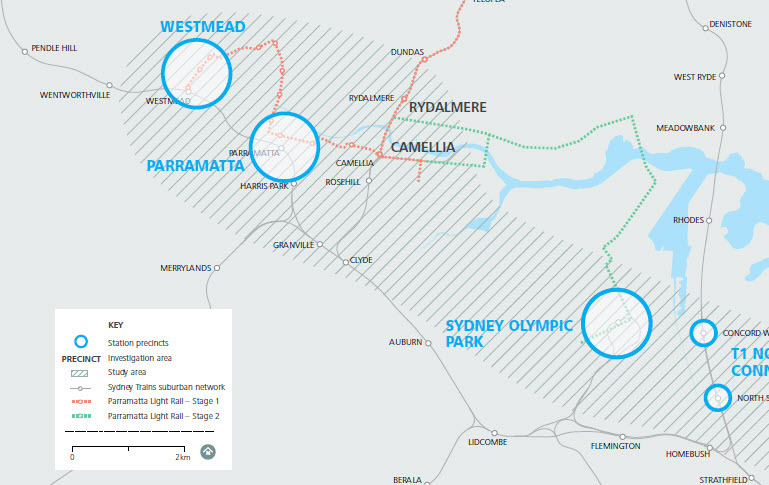 The State Government’s continued gradual unveiling of station options for the Sydney Metro West line between Parramatta and the Sydney CBD is slowly revealing the final route, suggesting a middle path between a high-speed line and a traditional frequent-stopping metro. While it is easier to see the final shape of this corridor, one factor could force a further revision – the March 2019 state election. The Opposition has promised to scrap the Bankstown Line conversion and commit instead to bring forward construction of Sydney Metro West. This raises a number of different scenarios for the final route, particularly at the eastern end. This article will discuss the Government’s latest proposals while a future post will look at how Labor’s commitment could be implemented and the implications for plans for this corridor. In November 2016 the State government announced the Sydney West Metro proposal but with comparatively little detail regarding the route or stations. Only four stops were identified – Parramatta, Sydney Olympic Park (SOP), the Bays Precinct and Sydney CBD. Direct Route: the shortest possible route between the SOP and the Bays Precinct stations, with additional intermediate stations at either Concord West or North Strathfield to interchange with the T1 Northern line, as well as one or two stops in the area bounded by Concord, Canada Bay, Five Dock and Leichhardt. Southern Route: a corridor from SOP running further south and closer to Parramatta Road, with an interchange with the Western and Northern lines at Strathfield. From there the line could proceed directly to the Bays Precinct with a station possibly at Five Dock or continue further south with stations at Ashfield and the University of Sydney. Northern Route: a link from SOP via Drummoyne and Rozelle to the Bays Precinct. Subsequently a cabinet leak suggested the government was considering up to four options but favoured two corridors which were similar to my suggested Direct and Southern Routes. The Government’s most recent announcement provides some clarity but has narrowed rather than finalised the various route and station options. However, the statement does confirm the previously-announced SOP and Bays Precinct stations while the corridor broadly appears to follow my suggested Direct Route, but with a few variations. An extension of the route westwards to Westmead. This was always on the cards; as the Overview indicates, a metro station here would “support the area’s health, education and residential precinct.” It also claims that an extension to Westmead will provide an interchange with the T-way and the planned Parramatta Light Rail (PLR) as well as “delivering a more efficient rail link between Westmead and Parramatta”. An interchange with the T1 Western Line either at Parramatta or Westmead. This suggests a choice between either a direct interchange at Westmead and a more northerly location closer to the PLR route in the Parramatta CBD, or vice versa; a direct interchange at Parramatta railway station and a metro station further north and closer to the hospital complex at Westmead. The Government is clearly keeping its options open in this regard. However, given the claims regarding the role of a metro station at Westmead would have in supporting the health precinct the latter would seem to be the more attractive option. Parramatta station was considerably enlarged recently and its infrastructure would seem much more able to support a major interchange than the existing station at Westmead. An interchange here would also better serve passengers on the Blue Mountains trains, which no longer stop at Westmead. A connection with the T1 Northern Line, either at Concord West or North Strathfield stations. This was an option I suggested in my previous post on the route. The project Overview stresses the reductions in travel times this interchange would provide for travellers from the Central Coast and Sydney’s north both to the Sydney CBD and Parramatta, indicating the Northern line will have a role as an orbital route as well as a segment in a radial corridor. Ironically, in helping to relieve some of the pressure on the T1 line between Strathfield and the city, this interchange would provide a response to the increased demand resulting from the Metro North West Line’s takeover of the existing Epping to Chatswood rail corridor. Intermediate station options between Parramatta and SOP at either Rydalmere or Camellia. Either station would provide another interchange with the PLR. The former would service the Rydalmere campus of Western Sydney University (WSU), provide an interchange with Victoria Road buses as well as improve access to nearby industrial and residential areas, while the latter would support urban renewal. Although a metro station at Rydalmere would appear to provide more benefits, it would also involve a deviation from the most direct route with two crossings of the Parramatta River. Intermediate stations between SOP and the Bays Precinct at Burwood North, Kings Bay or Five Dock. These areas are all cited in the Project overview as being dependant on road-based transport, with a metro station supporting employment and residential development as well as interchanging with bus services. The construction of all three is unlikely, though a combination of Burwood North with either Kings Bay or Five Dock is possible. Interestingly no station is proposed between the latter options and the Bays Precinct. Intermediate station between the Bays Precinct and Sydney CBD at Pyrmont. This would “improve accessibility to the suburb’s jobs precinct and attractions” as well as interchange with the Inner West Light Rail Line. Given that a Pyrmont metro station would be the second “bookend” to the Bays Precinct station planned for the other side of Rozelle and Blackwattle Bays, there is the potential for the existing light rail line to be extended in some way to connect the two to provide a local transport solution. “At least one” Sydney Metro West metro station in the CBD. This will provide “an easy interchange between suburban rail, new light rail and the new metro stations currently under construction”. The only single-station option that would provide a direct interchange between all three modes (including the CBD metro line under construction) is Central, while Martin Place station would provide a metro/heavy rail connection. In a single-station scenario Central would provide much more extensive interchange options but most passengers bound for the CBD would be forced to change. In addition this would require extensive modification to the expansion work already underway at Central to cope with Sydney Metro City line. A new station connected to the existing Martin Place railway station where a stop on the Sydney Metro City line is already planned would resolve this issue but the rail interchange would only be with the Eastern Suburbs-Illawarra Line, with a sub-optimal connection to the light rail. The phrase “at least one” new station opens up the possibility of two metro stations, one interchanging with the CBD metro and the other with the heavy rail network. Given the new metro would be entering the CBD from the west via Pyrmont here are several possible scenarios, for example, the planned metro station at Barangaroo and the existing St James Station, or Wynyard and the proposed Pitt Street station. Another option would be a new stand-alone CBD metro station plus an interchange at Central, though as noted earlier this would require modifications to the work underway there. Provision for future extensions to the west and south-east. Safeguarding a corridor to the proposed Western Sydney Aerotropolis was to be expected, though it doesn’t necessarily mean an extension will be constructed in this corridor given the number of other options to connect to the planned airport. An extension to the south-east had also been previously suggested, though the Overview specifies only a route via Zetland to the “south-east of the Sydney CBD”, and not a destination. Connecting to the CBD and South East Light Rail corridor at UNSW would seem to be a logical option. As we see the emerging outlines of the Sydney West Metro we can now make some educated guesses about how the line will operate, as well as its final design. Starting at Westmead, it seems likely it will take a relatively direct route to the CBD, apart from a possible deviation via Rydalmere and also a potential dip down to Burwood North. There will be a total of nine to 11 stations, with six or seven in the section between Parramatta and the CBD (not counting the stations at either end). Assuming a route length of around 22-24km this provides an average station spacing of around 2.5 to 3 kilometres. The Overview is sketchy on the subject of travel times but does suggest a trip between Parramatta and the Bays precinct would take less than 20 minutes. This indicates a journey time between Parramatta and the CBD of under 25 minutes. This is a moderate improvement on the current minimum travel time of around 30 minutes (achieved only by limited-stop intercity trains) but hardly constitutes a high-speed service. There will be an interchange with the T1 Western line at the western end at Westmead or (more likely) Parramatta but the current major rail interchange at Strathfield is to be bypassed. Instead, there will be an additional interchange with the T1 Northern line at either Concord West or North Strathfield. The Sydney West Metro will also connect with Parramatta Light Rail at several locations (Westmead, Parramatta and either Camellia or Rydalmere) and is also likely to connect with the Inner West Light Rail at the Bays Precinct and/or Pyrmont. There will also be one or, more likely, two CBD stations to facilitate interchange with Sydney Metro City and South West, the existing rail network and the CBD and South East Light Rail. The majority of the remaining intermediate stations nominated in the Overview will be located in places heavily reliant on road transport. They also offer considerable potential for commercial, industrial or residential development. Given the Government’s record it is likely that the capacity for substantial urban renewal will factor heavily in the final selection of station locations. However the scale of redevelopment planned for precincts around the sites of metro stations on the Metro North West and Metro City and South West lines has already caused a backlash. This could lead to local resistance to rather than acceptance of the Metro West line, particularly at planned station locations. The Overview also confirms that the University of Sydney once again loses out. While the university borders the broader study area, the revised route is unlikely to pass anywhere near its main campus and students will continue to have to make a minimum 500-metre walk from the eastern edge of the campus – and over a kilometre from its centre – to Redfern Station, or rely on bus services. Meanwhile, Western Sydney University could potentially gain a metro station at its Rydalmere campus and access to another metro station from its buildings in Parramatta. WSU Rydalmere and the University of NSW will also have light rail stops immediately adjacent to their campuses and Macquarie University will continue to have its own station on the converted Epping to Chatswood section of Sydney Metro North West. The next article looks in more detail at station spacing and the potential for an additional stop, while a future post will look at the implications of the Opposition’s promise to scrap the Bankstown Line conversion and bring forward construction of the Sydney West Metro (edited to update subsequent article sequence and topics). This entry was posted in Infrastructure, Public Transport, Sydney metro area, Western Sydney and tagged Infrastructure, metro, Rail, State Government, Strategic Planning, Sydney metro area, Transport, Western Sydney. Bookmark the permalink.